A backup copy saves the version of a website in a particular moment of time so you will be able to return to this version later. We recommend to create backups before making any considerable changes to your website so you will be able to roll them back and start over. Each week, we create a weekly backup of your entire website. If no changes have been made to the website, the system doesn’t create a copy. When the current month is over, the backup created after the first week of the month turns into a monthly backup. The other weekly copies for this month are deleted. If you make changes to your website each month, by the end of the year you will have 11 monthly backups. When it’s been a year since the website was created, the system makes quarterly backup copies. It starts with saving the first monthly copy of the year — turning it into the first quarterly backup. It happens if the first monthly backup is created more than a year ago and the time gap between the newest quarterly backup and the first monthly copy is more than 3 months. Manual backups can be created by the uKit users when necessary. 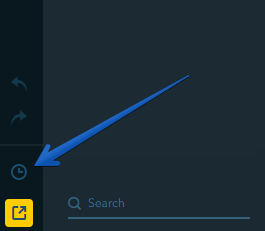 For this, open the Builder and click on the "clock" icon in the bottom left. Then choose + Create a backup. 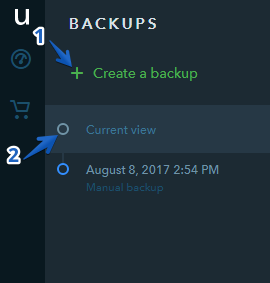 You can create up to 10 manual backups on uKit. Unnecessary backups can be removed at any moment. 45 people found this article helpful.